I was never the artistic type and always thought this was due to having neither the skill nor the inspiration to create something. Previous Matisse exhibitions (e.g. ‘Henri Matisse: The Cut-Outs’ at the Tate Modern in 2014) focused on his skill and ability to make radical art with creative flair. ‘Matisse in the Studio’ analyses the part that inspiration played in Matisse becoming one of the most famous artists of the 20th century. My key takeaway was that Matisse had the ability to either manipulate and influence the image of everyday objects, or use everyday objects to influence the image of other things in order to create art. One of the opening displays in the exhibition is an Italian chair that you could envisage in the drawing room of Marie Antoinette at the Palace of Versaille, or tucked away in some sort of Rothschild Chateaux. While grand, we are convinced that it is the type of everyday object that a man with the poetic stature of Matisse would have lying around his studio. The gist of the display is a glimpse of Matisse’s creative process: grand chair is transformed into loose and shadowy charcoal sketches of the outline as we can imagine Matisse mentally breaks down this item into its very essence, nature and substance. It is this ability to capture, however temporarily, a real world item into its abstract form that displays half of Matisse’s genius – he hears the notes that are being played, as well as the notes not being played and chooses to draw these. 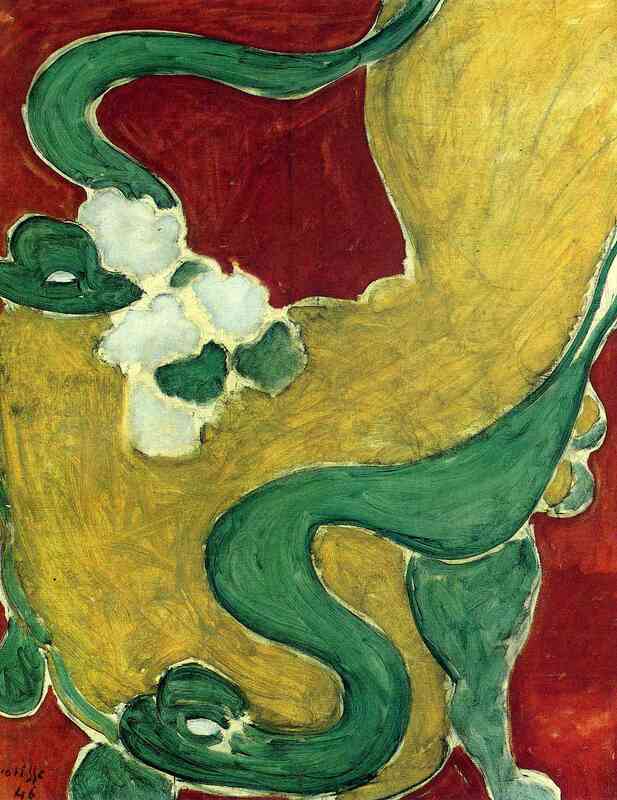 When compared to his end painting the application of Matisse’s creative skill is complete, as is the transformation of the chair. On the other hand, one of the closing displays in the exhibition proposes that Matisse used everyday objects to influence and change the imagery of other things. Below, Chinese calligraphy (if anyone knows what it says, please do drop me an email – I can imagine Matisse thinking it said something profound but it actually being a recipe for tea…) seemingly dictated how Matisse made some of his most famous works – cut-outs. The apparent distortion in Chinese ‘kanji’ (or lettering), compared to the Western/Latin alphabet, inspired Matisse to similarly distort the image of a mimosa tree until it came to be in the style he is perhaps best known for. Again we are taunted by Matisse’s genius; how many of us who walk the streets of Beijing (or, say, Tokyo) are so inspired by kanji ideograms to create works of art similar to Matisse’s cut-outs? My concluding thoughts on the exhibition is that at first it seemed too trivial to break down Matisse’s inspiration to a room full of artefacts from his studio. Even if we could find the single item that best seeded his thought process for a given piece of art (clearly easier to do for the chair than the calligraphy), does it add value to understanding it? Surely the artist’s emotions, mood, viewpoints and relationships, surely the entire context of his life and works are trivialised by this oversimplification. At the same time, it adds a certain depth and reality to one of the most radical artists in recent times. In any case, I learnt that transformation can occur in two important ways (changing an object or using an object to change another) and that each creates brilliant results. Matisse in the Studio is open until 12 November 2017. EY employees receive free access as part of our corporate partnership with the RA.